Digital X-rays | Blue Island, IL | Laurie S. Gordon, D.D.S. Just as digital cameras have virtually replaced traditional 35mm “film” cameras, the age of digital x-rays has brought us easier use, better clarity, and more versatility with every image. Digital x-rays use a x-ray machine similar to the one used with film. Instead of film in a plastic holder, they are made with an electronic sensor that is scanned to the computer screen. They can be immediately viewed on an enhanced computer screen and easily viewed by you and the dentist. Specific problem areas of a tooth can be enhanced with magnification, as well as brightness and contrast. Viewing an enhanced x-ray image on a computer screen can help with diagnosis. It is easier for you to see the problem and for the dentist to explain it to you, and review your treatment options. Digital x-rays are environmentally friendly. They eliminate the need for film and film processing chemicals that generate biohazardous waste. Dental x-rays require very low levels of radiation exposure which makes the risk of potentially harmful effects extremely small. 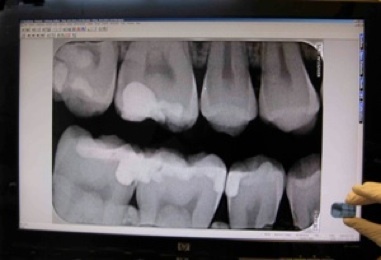 Dental x-ray equipment techniques are designed to limit the body's exposure to radiation.